Today is my Mum's birthday, so I thought I'd do a bit of a tribute. Back when I was much younger, my Mum and Dad used to drag us from flea market to flea market as my Mum tracked down every Star Trek paperback novel that had been published up to that point. This was all the old ones, like Spock Must Die and the adaptations of the TV and cartoon series. While I may not have appreciated it at the time, I think much of my collecting practice these days comes directly from those trips. I've learned that in the dusty corners of these kinds of markets, the most wonderful treasures can be found. And more, I remember back in 1987 when The Next Generation started airing, and we would gather on a Saturday afternoon (I think) and watch Picard and crew have amazing adventures. Basically, my Mum was the template of my geekiness. She even loves, to this day, to regale me with stories of having sat and read old Superman comics at the shop around the corner from her, back in the dawn of the Silver Age. Basically, I come by how I am quite honestly. One day I'll tell you about my Dad's proclivity for organizing the data he collects, and I'll come completely into focus. But as for the comic...it was amazing. Totally not what I was expecting, though I'm not actually sure what I was expecting. First and foremost, this was a great example of not judging books by covers, or comics in this case. The Gorn prove themselves a very interesting species, a reptilian version of the Klingons, perhaps. 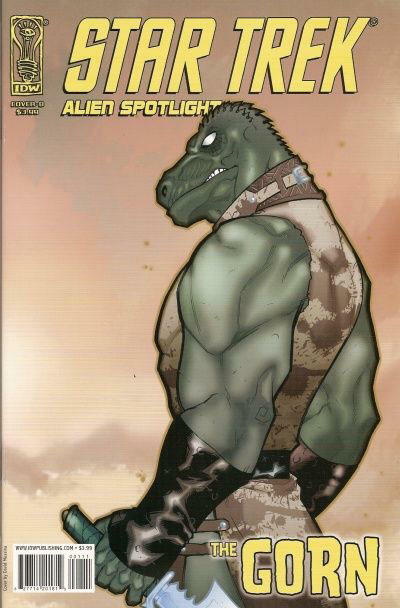 It was delightful to see a comic in which the first reaction of an ostensibly alien species to a human incursion is to render aid, rather than to attack. I'm sure there's been quite a bit written about them, but I kind of prefer getting bits and pieces, like this comic or the episode it carries on from, and having the race be more mystery than interlocutor. There's also a really tragic aspect to the comic, in that the Federation crew that we see are actually the doomed crew of the Reliant, the ship that Khan commandeers in Star Trek II: The Wrath of Khan. Though it's nice to see Captain Terrell demonstrating exactly why he's in charge of a ship, the knowledge of his fate ads a bittersweet melody to this tale. As usual, what I'm curious about is the reaction to this comic of people who don't know Terrell's fate. It would be a very different reading experience. I guess that's kind of what Stanley Fish's reader response theory gets at. Tomorrow marks the beginning of Pride month, so I'll be doing some special things to celebrate, not least of which will be a comic that somehow intersects with queerness, either explicitly or implicitly, each day of the month.